After 10 races on the Waitemata Harbour for the annual Maersk Line 18′ Skiff ANZAC Championship, Yamaha has come out as the clear winner. 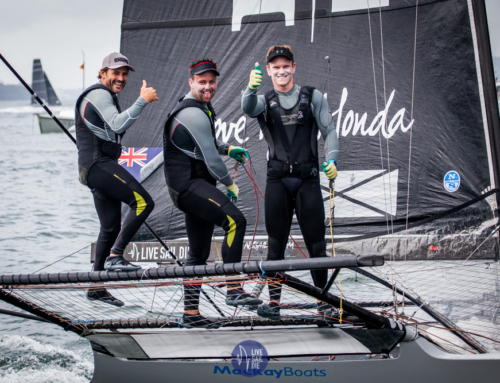 David McDiarmid, Matt Stevens and Brad Collins have stayed in the top spot for the entire regatta with four guns out of ten races. “Bloody good to come away with the win after finishing second at the JJ’s. We are pretty stoked!” said skipper McDiarmid. “Today was windy which was good. It was all on for the last couple of races. Matty was pretty good and only left the boat once! Brad was good too.” continued McDiarmid. Thurlow Fisher Lawyers were second place overall after missing race 10 due to a few issues. “We were definitely gunning for the win! But it was a top event and Yamaha sailed really well and deserve the win. They are very consistent. We went into race nine after the doing the sums knowing that we had to beat them, but they are just too slippery upwind,” said skipper Michael Coxon. “We didn’t end up racing the last race knowing what the outcome was going to be, and we had a few issues and a flight to catch so headed back to shore. “Well done to Yamaha, they sailed extremely well. It was a great regatta, the race committee did a great job getting all the races away and finally we got the south wester with flat water and finished off the regatta with some breeze.” continued Coxon. Noakes Youth had a glamour end to their regatta finishing third overall – their first podium finish this season. Skipper Ashlen Rooklyn was extremely happy with the great result. “We were unlucky on our second day, but put our heads down and got a couple of seconds and ended up with a spot on the podium. We are really happy, but wouldn’t be here without the support of Sean Langman,” said Rooklyn. At the prize giving, Yamaha thanked the “dingoes” for crossing the ditch to race in Auckland. “Without you lot coming over, we don’t get better. So thanks, and keep coming back, so we can beat you in Australia as well,” laughed McDiarmid. 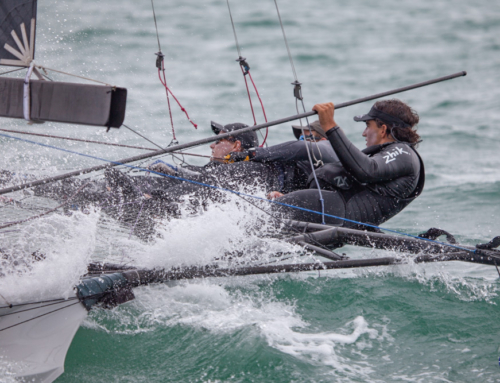 In 2015, the Auckland Sailing Club merged with Royal Akarana Yacht Club. ASC became the Auckland Skiff League, and the ANZAC Championship was the first major 18′ Skiff event managed by the RAYC team. The 18’s will now stay on the ramp at RAYC before being loaded back into containers and shipped to Fiji for the first annual Mark Foy Championship to be hosted by Denarau Yacht Club. Nigel Skeggs from DYC was at the prize giving and was excited to soon be hosting the fleet of 18′ skiff sailors. “The water temperature should be 28 degrees by then so leave your wetsuits at home!” said Skeggs.